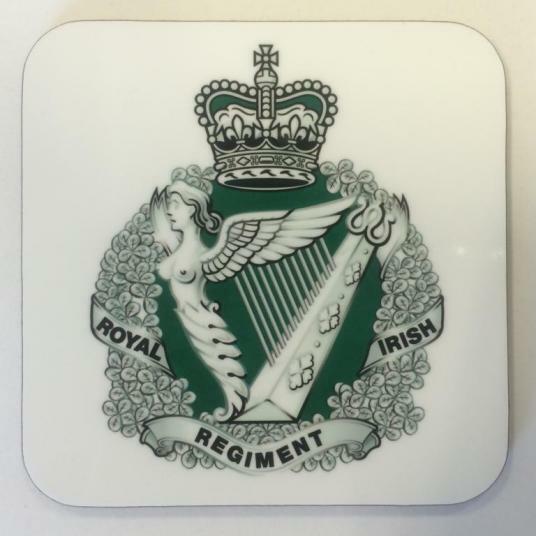 Cork backed heat resistant gloss finish with Regimental Crest. Matching mug available. 'I turned over one poor chap on a rocky, bloody crag on Tanngoucha. He was facing the right way, the last round of a clip in the breech and three dead Germans in front of him. His name was Duff. After all is over - and the remainder of the Empire is understandably irritated with Ireland - I hope these countless Duffs, from both the North and the South, and in all three services, will be remembered. We have a large archive of soldier records. Trace your military heritage through our Research Database. © Copyright 2019. The Royal Irish. All Rights Reserved.